Note: This article is presented with permission. Many rocks have a strange look in Cusco and surroundings. As if they once were soft and have been moulded to give them form. They have a finish that gives them a look as a mirror, with a strong reflection, a shine, sometimes like metal or glass. Omnipresent in all vestiges, but only seen in two of the three construction styles. 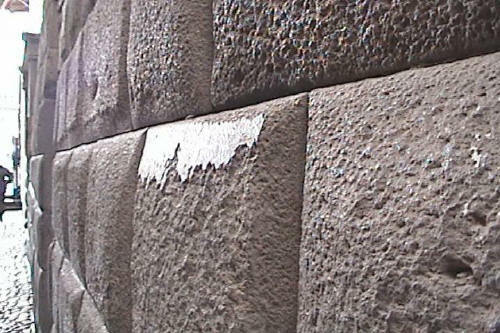 In the latest construction style, according to Alfredo Gamarra belonging to the Inca's, no vitrification is observed, but only stones treated with hammer and chisel, giving as a result walls in which the stones do not fit perfectly. 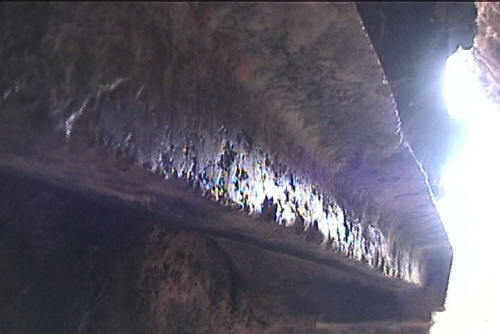 Of the other two styles, the first one is the style were rock in situ was treated. The appearance is like cut cheese or butter. Many times large pieces of stone are removed and the finish is perfect, with forms that appear like our modern package material (foam), with rounded internal corners. 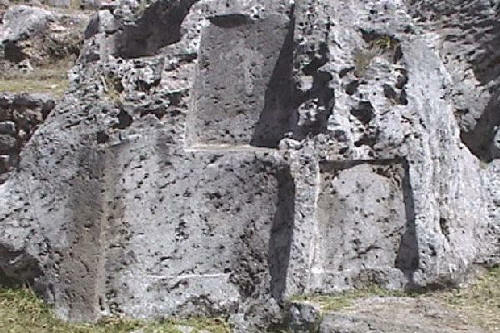 The rocks like that can be found in all vestiges considered Inca, and normally in the centre or below the other 2 styles. We can find these treated rocks also in many other places without the other 2 styles. Often they form something like an altar, and till present times they are places were people make offerings and do the worshipping to the earth or ''Pacha Mama''. The second style is the style of the perfect fitting stones. Walls were not even a needle enters between the stoneblocks. They can be found in different forms and sizes, but the general characteristic is the perfect fit. Also these stones have a part that is vitrified, this is at the borders. Sometimes also on other parts of the stoneblocks we can recognize vitrification. Another characteristic of these walls is the blueprint that the upperlaying stones left on the lower laying stones, as if the weight of the upper stones gave the print in the once softer underlying stones. These two styles can clearly be identified. For the eye the moulding and vitrification are obvious once you know how and where to look. Still orthodox science has other explanations. We have to realize though that there are just a few investigations that really gave importance to this phenomena. A serious investigation with includes anayzing stones etc. did not happen as far as I know, except maybe Protzen, who said he can reach similar results with polishing. He did that with only Andesite as a small proof. I do not consider polishing as a serious option to explain all the observed phenomena. The option that Alfredo Gamarra speaks about, with stones having been moulded and vitrified, is more logic. Some special technique must have been used by the ancients to be able to reach these astonishing results. All the time the melted look is present and obvious. 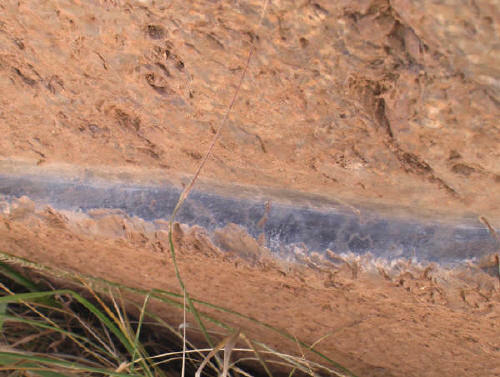 A layer is present at the surface where the vitrifcation is visible, sometimes the layer is interrupted because of some damage that occurred, and there this layer is clearly visible as a small ´film´ over the stone, this is independently of he type of rock. 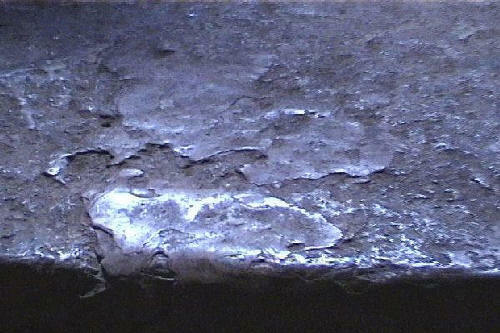 The surface is completely smooth for the touch in all cases, although the surface can be irregular (so it would have been extremely difficult to polish this irregular surface). The scale and the repetition and the form of the phenomena is such that the factor time and the difficulty to reach the precision doing it with carving and polishing, must be considered as ''not very probable'' and ''absolutely not common sense''. Useless for the Incas to do these kind of things and to spend so much time. Others have shown that many of these stones are magnetic, so something special happened with these rocks. The color on the treated rocks many times is different compared with the same but not treated rock nearby. 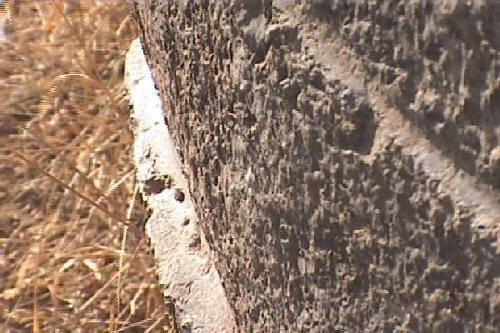 On the perfect fitting stone walls we see very small pieces of stone of lower blocks, entering to occupy the small space between the upper laying blocks, as if the weight of the upper laying blocks pressed the once soft stone below to go there, these very thin pieces of rock would have been broken if polishing and smashing with other stones or using metal tools would have been the method of construction. 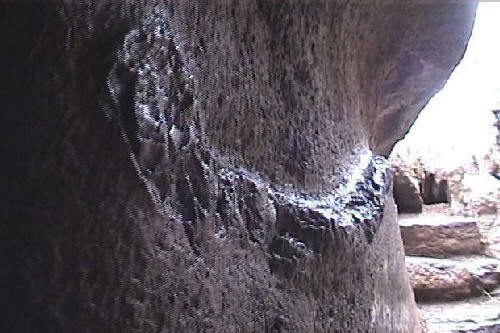 This can be observed in the walls of Koricancha for example. 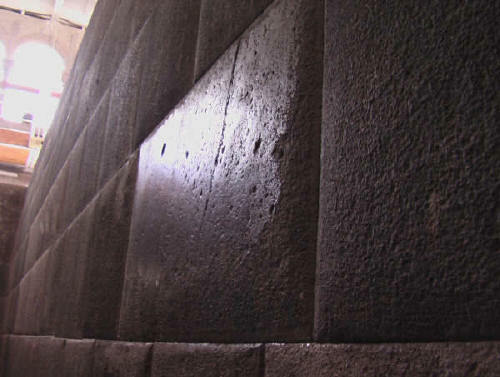 Repeated observation of all the phenomena mentioned above in all so called Inca vestiges, which includes different types of stone, and both construction styles: the walls with perfect fitting stones and the rocks 'in situ'. 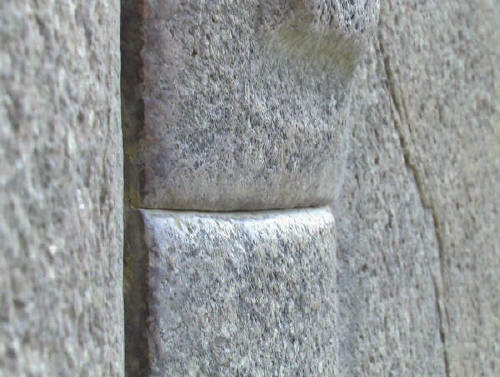 The rock surfaces on Inca stones are similar to those that have been thermally disaggregated. 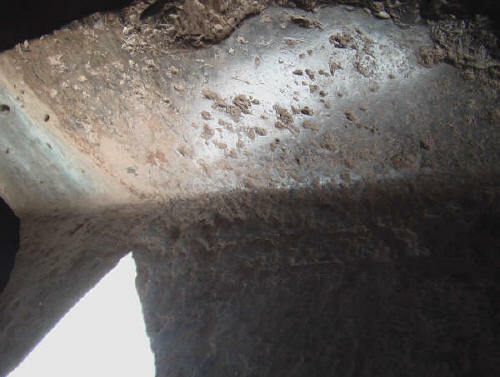 Indeed, some of the slick surfaces on the Inca building stones are glazed, so it becomes apparent that the Incas must have used thermal disaggregation. 2. Metal Clamps and T-grooves. 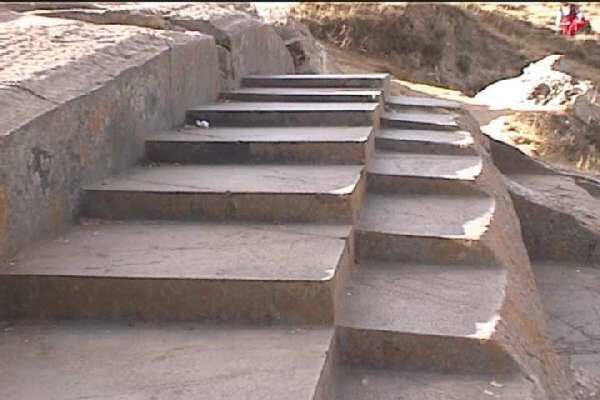 The use of Metal Clamps in T-Grooves happened in Tiahuanaco, Ollantaytambo, Koricancha and the site of Yuroc Rumi, Vilcabamba. Also in Egypt the use of clamps was found. 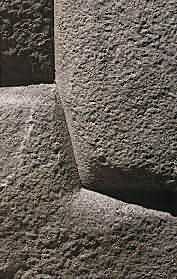 The grooves appear to be limited to the most monumental structures, as the size of the blocks in which they were used is huge. 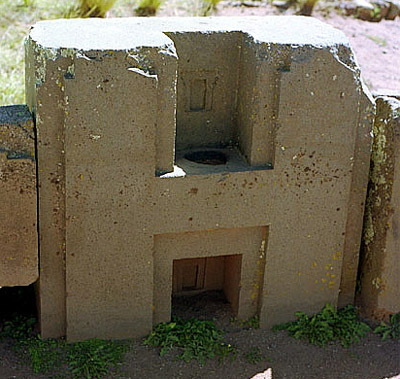 At the site of Pumapunku, Tiahuanaco, a number of grooves still can be observed. Some say the metal of these clamps is from a very special alley, others say it is of a composition that is perfectly normal for the bronze technology of the Tiahuanaco culture. The interpretation of the use. 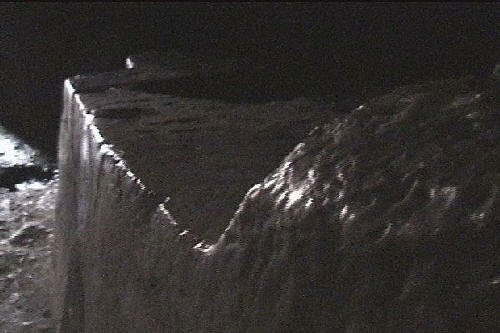 But Alfredo Gamarra said that the perfect fitting blocks do so because they were moldable on the moment of construction. If Alfredo was right, one can imagine that especially bigger blocks were more difficult to treat, as the weight of the clay-like block would have given problems to keep them in place, and the clay could have had the tendency to deform. The clamps would have served for keeping the blocks together, so they would harden out in the right position. 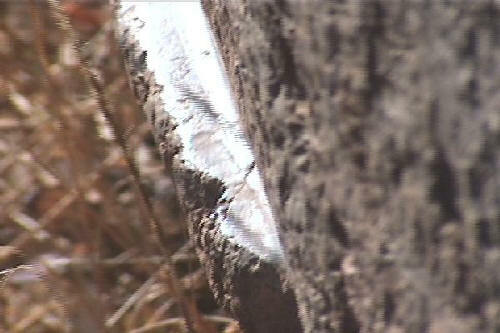 The observation that the groove has been polished is important here. The same can be observed on the borders of the stones of the perfect fitting walls. Some technology with heat was applied to give form and strength to the construction. This means the shine is not because of polishing, but would be vitrification. The same counts for the T-Grooves. 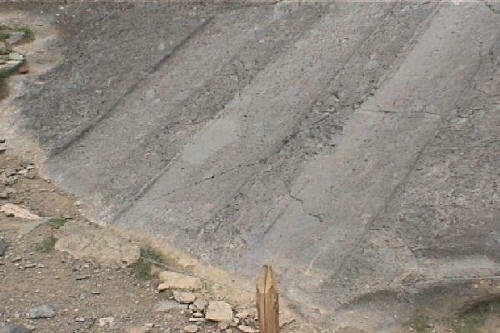 From the picture of the stoneblock with the T-groove in Ollantaytambo, it can be observed that also a bigger part of the stone is vitrified, not only the part of the groove. Is this conclusion of vitrified and moldable stones the same as with the theory of the geopolymeres of the pyramids in Egypt? Stone on the moment of construction was soft and moldable. Because of this the stones fit perfectly. The construction style of perfect fitting stones has been done with different types of stone, what means that for every type of stone there should have been a formula for the making of cement. Something that is much more complicated, so less probable as an explanation. 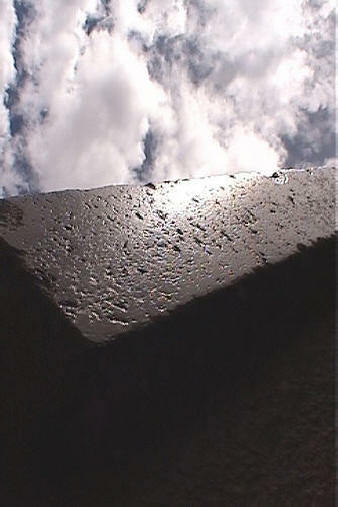 The use of cement is not completely logical; why has each stone another form and size? More logical it would have been to use a mold and in this way a standard size of stone, to make the construction- work easier. The proposal of Alfredo Gamarra means that every stone can be unique in size and form, but that at the same time, without any complications, they fit perfectly together. Making a mold for each stone would have made the work unnecessarily more laborous and more complicated. Vitrification is everywhere, see more pictures below and the video in our chapter 'Vitrified Stone', a courtesy from the DVD. As stated before, vitrification is to be seen in all the Inca vestiges. See the pictures on the right and the video below. 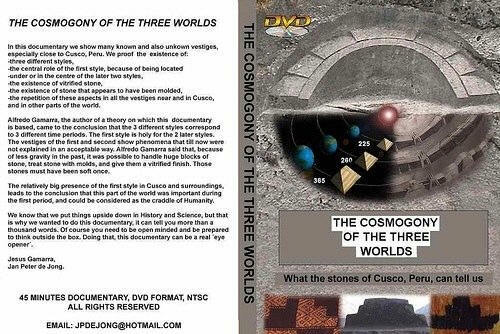 The video is a courtesy, so you can get an impression of our video 'The Cosmogony of the 3 worlds' and the interesting and fascinating information and images that you can expect in this documentary. On the DVD this chapter is to be seen in full DVD quality of course. The Hanan Pacha time period. This is a reference to the first orbit with human life. A time with less gravity, when the earth was closer to the sun. Speaking about the 'Sacred Rocks' of the first style, we refer to this period. 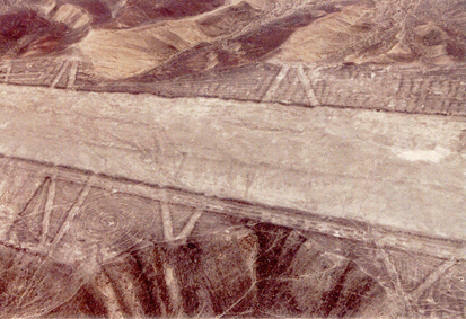 The constructions were made in the rocks themselves, those rocks that nowadays form the base of many ancient vestiges. Especially those of the Inca's, but also in Egypt and other places. See 'Other ancient cultures'. The Uran Pacha time period. This is the next period, in which the style of perfect fitting walls was made. This period was before our present period. On our DVD this is one of the chapters. The Cosmogony of the 3 worlds. 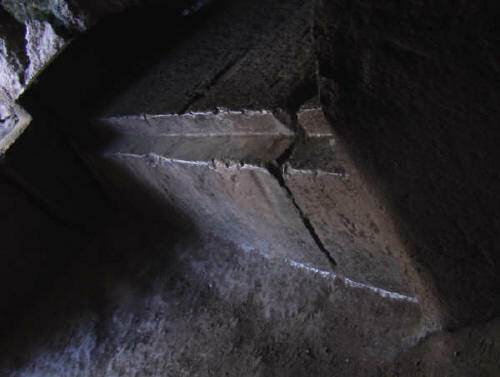 The archaeological proofs on a DVD , explaining the ancient mysteries of the Inca vestiges. Near the Throne of the Inca and the rodaderos. possible to observe the smoothness, and the look as if it has been melted once. Ollantaytambo is an excellent site in the Sacred Valley of the Incas, here all kinds of vitrified and moulded stones can be observed. and a different colour to be observed.especially at the borders. Loreto street is a small street leaving from the Plaza de Armas, the central square in the centre of Cusco. 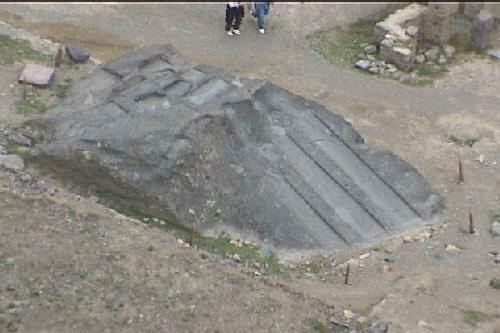 It should be a tipical example of Inca masonry if orthodox archaeology is to be believed. 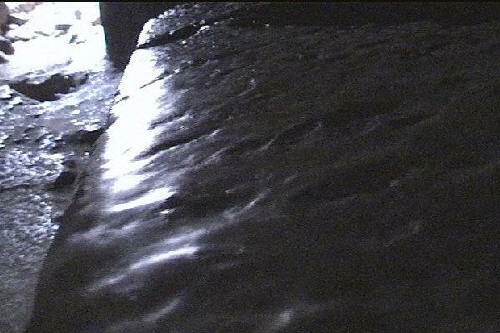 But a closer analisis can show how much difference there is between the walls on both sides of the streets. 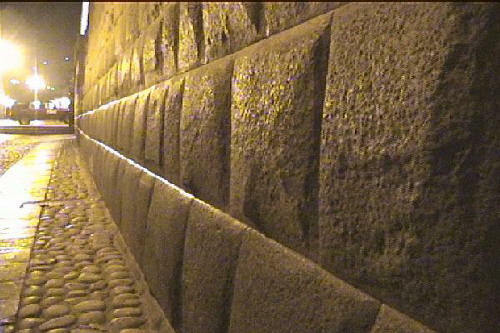 On one side the wall is the style of the Inca's according to Alfredo Gamara's definition; there are no perfect fits and the stones were treated with hammer and chisel. The other side shows us a wall with perfect fitting stoneblocks and moulded and vitrified stones. This can be observed by day, and by night with the help of the street lights. 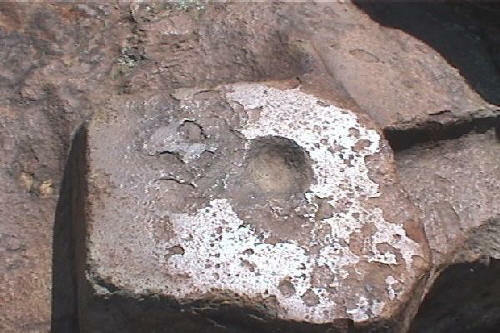 A small vitrified part on a stoneblock. The borders of these stones are all vitrified also. 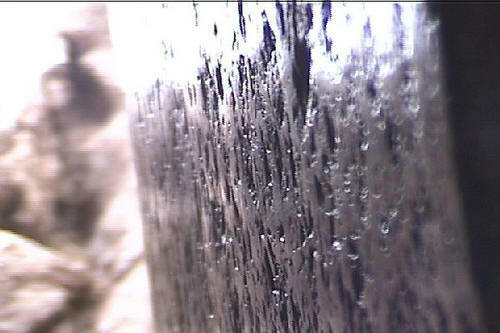 On this picture the vitrified borders can be seen clearly. The famous Inca temple of the sun in the centre of Cusco. There is a museum that has many strange rocks to show us. We got special permission to take pictures and video. That is to be seen on our DVD . Here we present some vitrified stones, that also here can be recognized. Chinchero is a beautiful village. 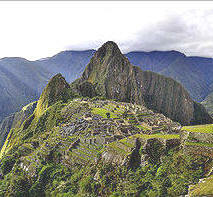 There is also a great vestige, with all the characteristics of the other vestiges in and near Cusco. It's just off the road that goes from Cusco to the Sacred Valley, at only 30 kilometres from Cusco. 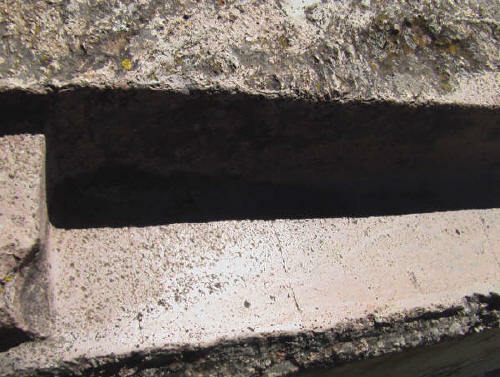 A vitrified and moulded stoneblock, Plaza de Armas Chinchero. explaining the ancient mysteries of the Inca vestiges. This article is presented with permission.